Tyrannosaurus rex Toe Claw. 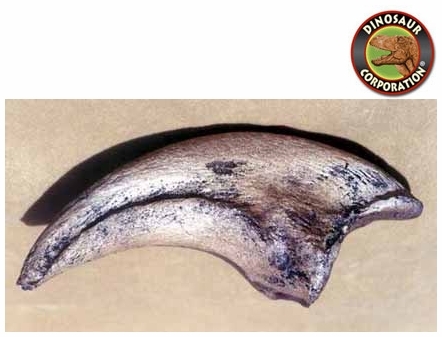 Dinosaur toe claw replica. Cretaceous South Dakota. Tyrannosaurus rex was one of the largest land carnivores of all time; the largest complete specimen, FMNH PR2081 ("Sue"), measured 12.8 meters (42 feet) long, and was 4.0 meters (13 ft) tall at the hips. Mass estimates have varied widely over the years, from more than 7.2 metric tons (8 short tons), to less than 4.5 metric tons (5 tons), with most modern estimates ranging between 5.4 and 6.8 metric tons (between 6 and 7.5 tons). Although Tyrannosaurus rex was larger than the well known Jurassic theropod Allosaurus, it was slightly smaller than Cretaceous carnivores Spinosaurus and Giganotosaurus. The neck of T. rex formed a natural S-shaped curve like that of other theropods, but was short and muscular to support the massive head. The forelimbs were long thought to bear only two digits, but there is an unpublished report of a third, vestigial digit in one specimen. In contrast the hind limbs were among the longest in proportion to body size of any theropod. The tail was heavy and long, sometimes containing over forty vertebrae, in order to balance the massive head and torso. To compensate for the immense bulk of the animal, many bones throughout the skeleton were hollow, reducing its weight without significant loss of strength. The largest known T. rex skulls measure up to 1.5 meters (5 ft) in length. Large fenestrae (openings) in the skull reduced weight and provided areas for muscle attachment, as in all carnivorous theropods. But in other respects Tyrannosaurus� skull was significantly different from those of large non-tyrannosauroid theropods. It was extremely wide at the rear but had a narrow snout, allowing unusually good binocular vision. The skull bones were massive and the nasals and some other bones were fused, preventing movement between them; but many were pneumatized (contained a "honeycomb" of tiny air spaces) which may have made the bones more flexible as well as lighter. These and other skull-strengthening features are part of the tyrannosaurid trend towards an increasingly powerful bite, which easily surpassed that of all non-tyrannosaurids. The tip of the upper jaw was U-shaped (most non-tyrannosauroid carnivores had V-shaped upper jaws), which increased the amount of tissue and bone a tyrannosaur could rip out with one bite, although it also increased the stresses on the front teeth. * The premaxillary teeth at the front of the upper jaw were closely-packed, D-shaped in cross-section, had reinforcing ridges on the rear surface, were incisiform (their tips were chisel-like blades) and curved backwards. The D-shaped cross-section, reinforcing ridges and backwards curve reduced the risk that the teeth would snap when Tyrannosaurus bit and pulled. * The remaining teeth were robust, like "lethal bananas" rather than daggers, more widely spaced and also had reinforcing ridges. Those in the upper jaw were larger than those in all but the rear of the lower jaw. The largest found so far is estimated to have been 30 centimeters (12 in) long including the root when the animal was alive, making it the largest tooth of any carnivorous dinosaur.